AUCTION DATE: THURSDAY SEPTEMBER 12, 2013- STARTING @ 11:00 A.M.
3’’ THROUGH HOLE, S/N TL-07. 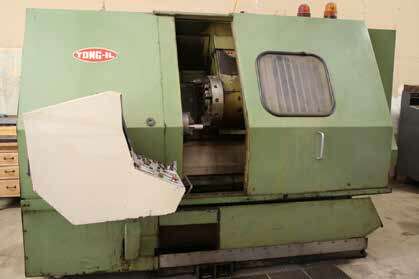 TURNMASTER 13 X 40 ENGINE LATHE, WITH 8’’ CHUCK, 5C COLLET CLOSER, MODEL 1340. MODEL 375-4, TOOL AND CUTTER GRINDER. TWIN WHEEL TOOL AND CUTTER. ENCO 7’’ HORIZONTAL BAND SAW. PECK STOW 36’’ HAND ROLLS. KELLOGG AMERICAN 7.5HP AIR COMPRESSOR. TOOLING, VISES, ROTARY TABLES, INDEX, CHUCKS, AND END MILLS. COLLETS, TOOLING AND CUTTING TOOLS. INSPECTION TOOLS, CALIPERS, MICS, GAGES AND SUPPORT.